At the village school he learned to draw and became interested in art, later winning a scholarship to the Royal College of Art in London where he rubbed shoulders with Barbara Hepworth, Henry Moore and Edward Burra. 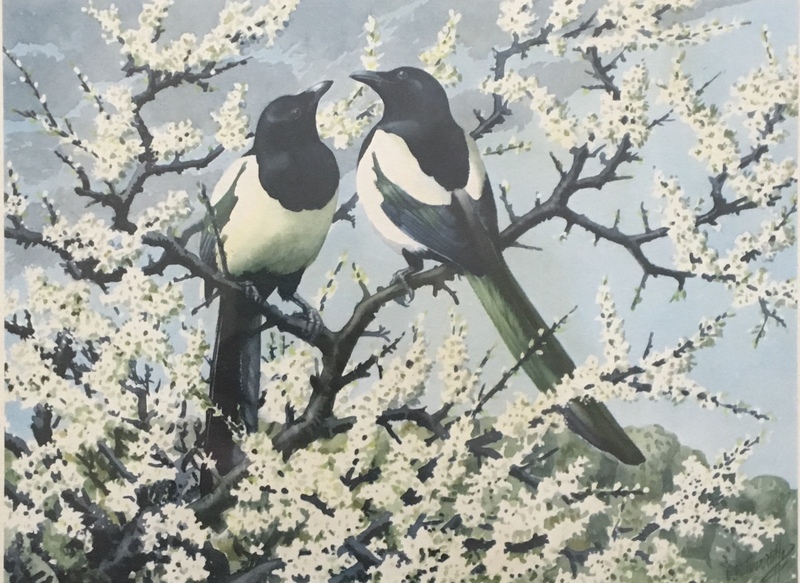 After graduating Tunnicliffe began to make a living from selling etchings and engravings of rural scenes, but with the onset of the depression in 1930s the market for prints declined, so he began to teach illustration and graphic design. His big breakthrough came in 1932 after his wife had encouraged him to submit illustrations for a new edition of Henry Williamson’s best-selling novel Tarka the Otter. It was this series of wood engravings that bought Tunnicliffe widespread recognition. In 1947 Tunnicliffe’s long association with Anglesey began when he moved from Manchester to ‘Shorelands’ a cottage at Malltraeth, on the estuary of the Afon Cefni near Newborough, where he lived until his death in 1979. On Anglesey, Tunnicliffe set about consolidating his knowledge of the island’s many bird haunts. In 1952, one of his best-loved books, Shorelands Summer Diary, was published – one of the artist’s masterpieces; it’s an evocative record of one glorious season on Anglesey. In 1954, Tunnicliffe was elected a fellow of the Royal Academy in recognition, not just of his excellence as an illustrator and bird portraitist, but also for the breadth of his achievement in a variety of media – watercolour, pen and ink, woodblock engraving, etching and scraperboard – and across a variety of subject matter. In Tunnicliffe’s bird paintings, artistic interpretation was rooted in meticulous observation and precise scientific method. 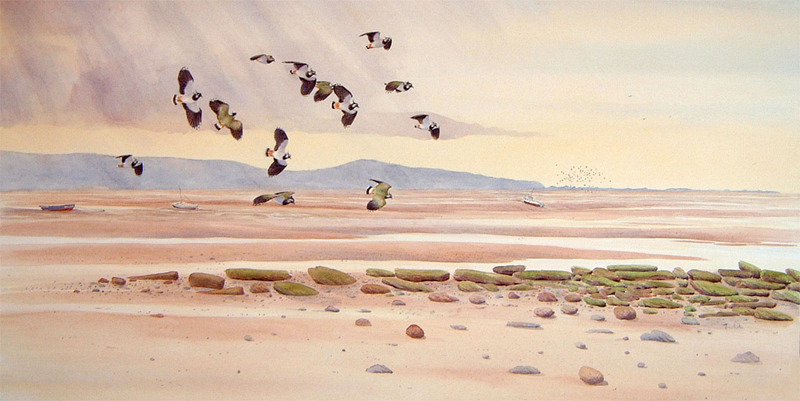 This is powerfully illustrated in the current display of the artist’s work at Oriel Ynys Mon, which features a number of the measured drawings through which Tunnicliffe recorded – from various angles and to within a millimetre of accuracy – the details of specimens that had been brought to him. His feather maps as he called them. Peter Scott, the ornithologist, broadcaster and fellow artist, believed that ‘the verdict of posterity in time to come is likely to rate Charles Tunnicliffe the greatest wildlife artist of the twentieth century’. Another source leading to the finished works were the high-speed drawings that Tunnicliffe made in the field, especially around Cob Lake, the Cefni Estuary, South Stack Cliffs, Llyn Coron, Aberfraw, and Cemlyn. These were then worked up in a superb set of sketchbooks full of accurate and colourful ‘memory drawings’. These sketchbooks are works of art in themselves, and examples of these are on display at Oriel Ynys Mon, too. The open pages reveal the drawings and watercolours that the artist made to quickly record the details of the colouring and movement of a particular bird or animal. Alongside, he would add copious hand-written notes. He was very skilled artist in a wide range of media and his work was used to illustrate many magazine articles, books and advertisements. He created a superb personal collection of measured drawings of birds and was a major contributor to RSPB Bird Notes. He also took on many private commissions. One of my favourite artists along with Thorburn and Talbot Kelly to name a few.